This specie, as the name suggests are natives of Cuba, is recognized as one of the largest frogs belonging to the regions in North America. They tend to consume anything that fits well in their check pouch. They pose a real threat to the survival of other species on which they feed. The Cuban tree frog changes colors of the body depending on the temperature and the environment. The head skin is well attached to the skull. They also portray cannibalistic nature when hungry. 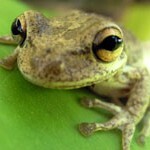 They feed on frogs from their own community in extreme scarcity of food. The toes are larger in comparison to other frogs. They have unique digestive techniques and usually swallow their foods with the help of the eyeballs. In Hawaii, the selling of these species has been totally banned. In fact the convicted can be put behind the bars for one year along with a fine of $25000. These species originally belong to the regions in Cuba, Bahamas and the Cayman Islands. They have now spread out to Puerto Rico, Virgin Islands, USA, and Hawaii. In addition to this, they can also be spotted in Southern parts of Carolina and Florida. 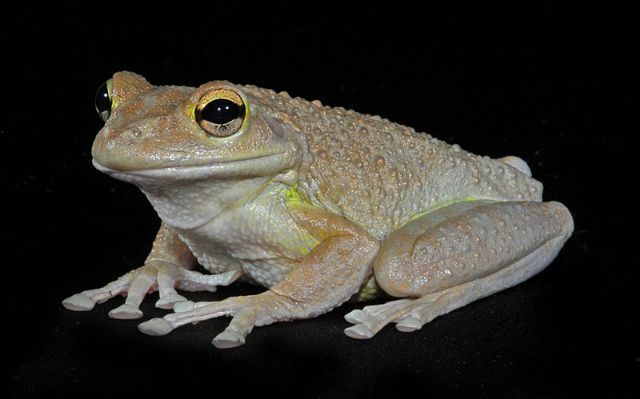 Length of Cuban Tree Frog: This size of these species varies from 3-5.5 inches. The males are however, shorter than the females. 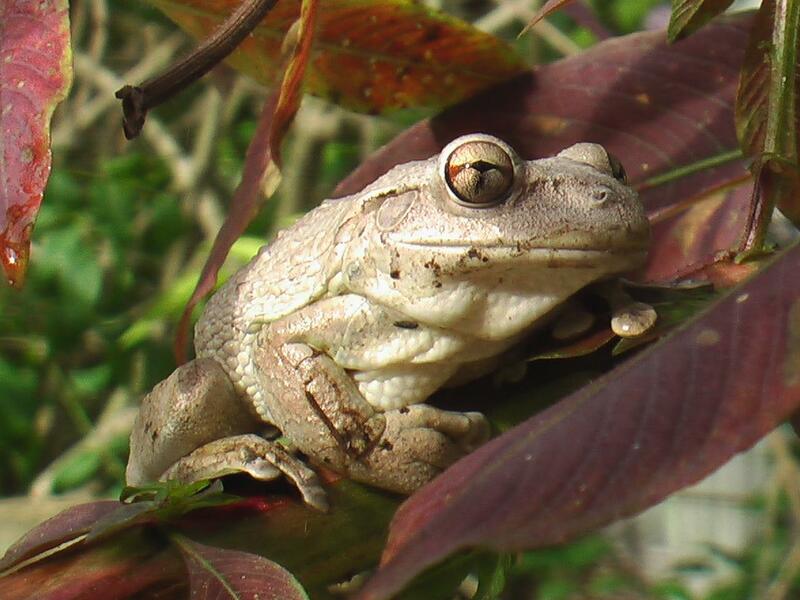 Color of Cuban Tree Frog: The color of these species may range from olive brown to grayish white to bronze. There are also some dark colored dots on the back and the legs. The portions of the legs that in mostly invisible is orange in color. 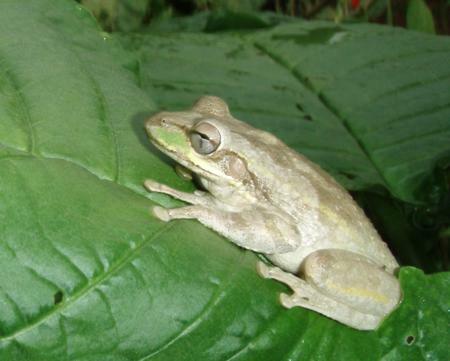 Body of Cuban Tree Frog: Their body is rounded and has enlarged caudal fins. Skin of Cuban Tree Frog: The skin appears to be pretty rough. Head of Cuban Tree Frog: The eyes of these species have orange hues. The head skin in contact with the skull restricts the loss of water. Teeth of Cuban Tree Frog: These frogs have about 6 rows of teeth. There are 4 rows of lower jaw and 2 rows of the upper jaw. These species sleep on trees during daytime and hunt during the night for food. They are outstanding climbers and usually attack the insects near a source of light. These frogs are quite ecofriendly and live in harmony with the human community. These species prefer to have any kind of food that can be easily digested. These include insects, crickets, cockroaches, smaller frogs, lizards, hatching birds and small snakes. These species prefer to dwell in areas with lots of medium and large sized trees and prefer high humid conditions. They are generally found in places where minimum temperature lies above 10 degree Celsius while the temperature during the day should be within 23-29 degree Celsius. These frogs also survive well in the brackish water. Usually when they jump to free themselves from their predators, their feet glows in bright orange that eventually flusters their enemies. The head skin is attached to that of the skull showing lesser number of blood vessels. This helps in preserving water. These species also produce a toxic secretion in order to abstain from predation. It becomes a real challenge for the predators to track these species because of changing body colors. 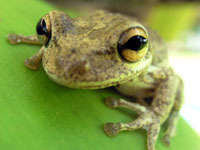 The Cuban tree frog attains maturity by the age of 5-7 years. These species usually mate during anytime of the year especially during the wet months of May to October. In the breeding season, the males develop black colored nuptial pads over their thumbs. The female counterparts can lay eggs at any kind of place including swimming areas or the bucket. Each clutter consists of about 3900 eggs and takes about 30 hours for eggs to hatch into tadpoles. The tadpoles may vary in patterns and colors. The transformation from tadpoles to grown up frogs takes about 30 days. These species like to have algae, other kinds of tadpoles and may also resort to cannibalism. These species generally call out during the night. They produce a snoring sound that is quite similar to that of the southern leopard frog. One can easily get one in the pet stores of North America. However they are generally not preferred as pets because of a toxic secretion that might cause skin & eye irritation. 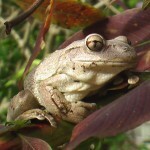 These frogs can also be dreadful to other animals. 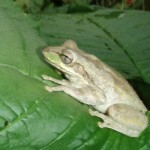 We present a few petting essentials regarding the Cuban tree frog. Proper Housing: The ideal tank size should be 20 by 24 by 10 inches. The tank should be equipped with enough hiding area with fake plants but needs to be covered well on the top. Proper Water: These frogs do not need a pool as they don’t really like to swim but they like to keep their skin wet by taking a dip in water every now and then. Hence a small pot of normal tap water should solve the purpose but it needs to be changed regularly. Proper Temperature: Make sure that the temperature of the tank does not go below 70 degree otherwise they might fall asleep. Instead the temperature should be set within 88-90 degree Fahrenheit. Proper Food: These species like to have crickets, flies, worms, cockroaches etc. At least once in every week provide them with minerals and vitamins. Temper: In a tank it is better not to pet more than two frogs in the same tank. 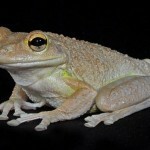 These species are known to thrive on other frogs & lizards. These species can live for 5-10 years. According to the reports of IUCN these species are in the category of less importance in the endangered list but they are harmful to the survival of other precious species on which they predate.